If food is your thing, Denver will find your sweet spot. The first place locals say you have to try, to get a sense of Old Denver, is the historic steakhouse saloon, Buckhorn Exchange, which serves local fare for the adventurous, including Rocky Mountain Oysters, buffalo, yak, rattlesnake and ostrich. Then there’s City, O' City, an all-day favorite (seriously, it’s open from 7am-2am) for vegetarians. At City, O’ City, you’ll find not only hippie stables like seitan wings and tempeh bacon, but meat-free takes on classic comfort foods like poutine and chicken and waffles (made with bourbon-brined chicken-fried cauliflower, of course). There’s even a full-service cocktail bar, because nobody said vegetarians can’t have fun. 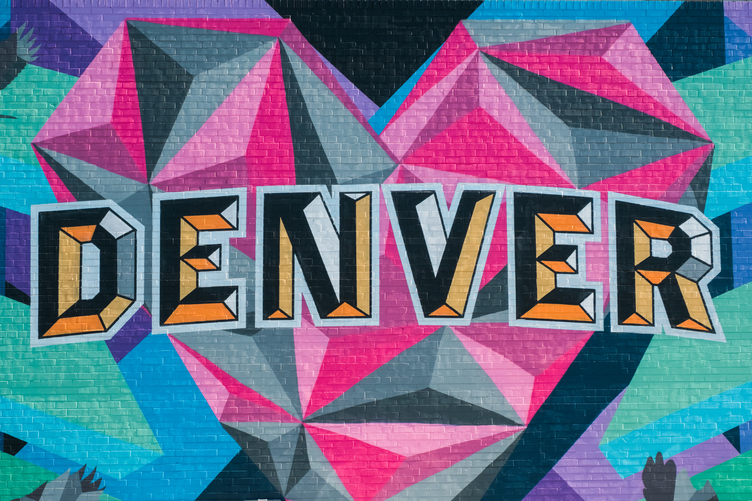 Head to RiNo, the industrial warehouse and auto body area formerly known as River North, to find the city’s most exciting art spaces, maker spaces, indie fashion houses, and graffiti-adorned alleyways. Hit openings at Redline, a nonprofit contemporary art center that is the soul of the neighborhood, take a macrame or piñata-making workshop at River North Workshop Co., or buy some hand-crafted bell bottoms and gemstone jewelry at Meraki Moon. And then make your way to The Source, a hotel where locals like to hang and where you’ll find a collection of artful restaurants, shops, and a brewery under one roof. A former mortuary might not seem like a sought-after place to spend your afternoon. But Linger Eatuary is beloved by locals, who crowd this LoHi—or Lower Highlands neighborhood—hot spot. As if Linger’s past life as a funeral parlor wasn’t novel enough, the restaurant hoisted a 1975 RV onto its roof. The retro recreational vehicle functions as the patio’s kitchen and bar, where it serves eclectic, internationally-inspired $5 small plates at happy hour. Try the vegan Persian Slider (hummus, dill Havarti cheese, Israeli salad, avocado and arugula) or a gluten-free Korean BBQ taco (Wagyu short rib, green bean slaw, radish, wasabi peas, gochujang aioli, ginger and lime). Denver’s Old West vibe extends to a music scene rooted in the city’s Gold Rush-era reputation as an entertainment town—a place to come to spend your gold earnings on vaudeville and burlesque. In recent years, many of the historic theatres from Denver’s early days—places like the Ogden (built in 1919), the Bluebird (1913), and the Gothic (1929)—have been reborn as live music venues. Of course, no venue is more beloved than Red Rocks, the legendary amphitheater where you can see “the most amazing bands in the world” perform in what the venue claims is the only naturally-occurring, acoustically perfect amphitheater on earth. Pop up into Denver’s many diverse neighborhoods and cruise back down around the mural-covered banks of Cherry Creek with a ride along this gorgeous 42-mile trail. To see the city the way the locals do, buy a 24-hour ($9) membership to the B-Cycle bike share program and take your borrowed two-wheeler for a spin. Cruise down the Cherry Creek pathway, checking out local spots like the Denver Skatepark, the largest free skatepark in the country, Tattered Cover Bookstore, and the historic but newly transformed Union Station, which has an urban beekeeping program on its downtown roof. Or grab a kayak at Confluence Park, where Cherry Creek meets South Platte River, and paddle your way through the heart of the city. After all, not every capital has rapids running through it. Opened the day after Prohibition was repealed in 1933, El Chapultepec Jazz Club—locally known as “the Pec”—is an old-school Mexican cantina turned nationally-known jazz venue. It’s a dive bar that has hosted musical greats and former presidents: Count Basie, Frank Sinatra, Tony Bennett, Wynton Marsalis, and Ella Fitzgerald all played here. So did Bill Clinton and his tenor sax. Despite its famous guests, the Pec remains an authentic, rough-around-the-edges Western dive. Picture pink neon lighting, pink vinyl stools, and paper plates serving Denver staples like burritos smothered in green chile (this is a VERY BIG DEAL to locals). In a town where craft beer rules, the Pec maintains the oldest Coors account in Colorado. For something stronger, try the Chapultepec Shot, a shot of silver tequila with a dash of green Crème de menthe and a dehydrated edible grasshopper.